What in the world is going on with the Columbus Blue Jackets? After a lackluster, embarrassing 4-1 loss to the Edmonton Oilers on Thursday, they sit out of the playoffs with just eight games to go in the season. Although there is time to change the narrative, Thursday’s game in Edmonton served as a red alert to the status of the team. On all levels, the Columbus Blue Jackets have a lot of explaining to do. The scary thing is, there might not be answers to these critical questions. Remember the early momentum the Blue Jackets had after acquiring Matt Duchene? They recorded back-to-back shutouts against Ottawa and San Jose. It seemed they were ready to make their move up the standings. They were all-in. So what has their record been since the trade deadline? The Blue Jackets are 5-7-1 since the deadline including five straight losses on the road. For a team with six 20-goal scorers, what gives? This is completely unacceptable. In my eyes, everyone is to blame, top to bottom. There’s no one individual you can pin this on. This meltdown is a total team effort, management included. The Blue Jackets best offensive weapon, Artemi Panarin, is going through his worst slump of the season. Pierre-Luc Dubois has disappeared into the night. Cam Atkinson has followed their lead. The result is a team having trouble scoring goals at the worst time. This is where you would have thought having Duchene and Ryan Dzingel on board would ease the pressure on the top line while maintaining offensive production. Instead the production have been very offensive and not in a good way. In the month of March, the Blue Jackets have scored a total of 21 non-shootout goals in 11 games. That is less than two goals per game. Even worse, that includes a game against Boston where they scored seven! So take that game away and you have a team that has scored 14 times in 10 other games this month. This includes being on the wrong end of three shutouts. Where is the top line? They’ve become a complete non-factor in the most critical games of the season. Their slump even prompted them to get together for dinner to talk things out. Although they played better in Calgary, they reverted to their chilly status in Edmonton. This does beg an important question that must be considered. Has Panarin in his mind already checked out of Columbus? John Tortorella immediately denied any thought of a player quitting when recently asked about it. But based on the way he is playing, this is a red alert. If he’s not dangerous, his linemates will feel the effects. In recent games, he’s been easy to play against. He doesn’t shoot enough when given the chance. Even when he does, it’s not from the high danger areas. He’s played like a man who has in mind in sunny South Florida. This brings us to management and another important question we must consider. Why Did Management Keep Panarin/Bobrovsky? 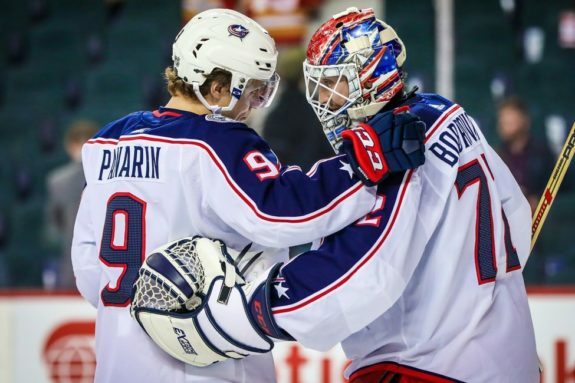 On the surface, we know why both Panarin and Sergei Bobrovsky were kept by the Blue Jackets. Both are elite talents that can absolutely change the dynamic of a game. It’s not out of the realm they can still do that in these last eight games. But given the season-long distraction their situations were, we have to ask the question why didn’t management move on from them knowing the possibility of missing the playoffs was a thing that could happen? Could you imagine the assets they’d have if they made this move? Management has long maintained that this is a good team. That part you really can’t argue despite their recent play. They can be a good team. But was this team ever good enough to push all their chips to the middle especially given the distractions of the season? That’s where management must be held accountable. 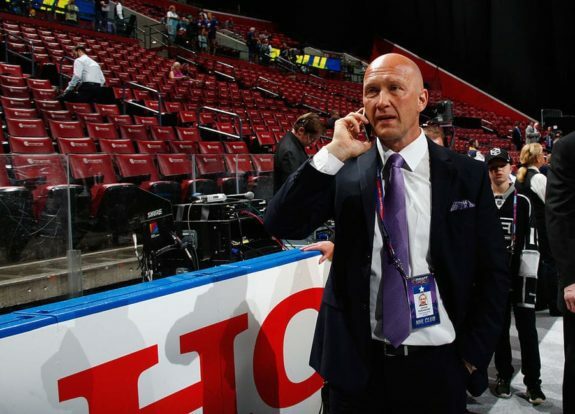 They determined the best course of action was to self-rent Panarin and Bobrovsky while adding key pieces in Duchene, Dzingel, McQuaid and Kinkaid. These moves cost them a lot of valuable assets. Vitaly Abramov is gone. Their 2019 first-round pick is most likely gone as well (except if they miss the playoffs and win one of the three lotteries.) They might lose their 2020 first rounder as well, but that’s if Matt Duchene signs long term. That would lessen the blow considerably. But the point is we are looking at a situation where the Blue Jackets could miss the playoffs while allowing all of Panarin, Bobrovsky, Duchene and Dzingel to walk away for absolutely nothing while losing a first and a good prospect. Jarmo Kekalainen said even if this happens, they’ll be ok. They cite cap space and existing prospects in the organization as a key reason for this. Sorry, but to deem this team a Cup contender right now is foolish. Management has stuck behind this core. But the reality is that they haven’t won anything. There have been zero playoff-round wins with this current core and with Kekalainen as general manager. Kekalainen has been here since 2012. At what point do we start to question his decision making and asset management. While they have been some great moves, there’s been some equally brutal ones too. What Kekalainen has done for the Blue Jackets overall has been good lifting a team from the pits to this point. But the expectations are different now. They will be measured on playoff success. Kekalainen said it himself. Not going four rounds in the playoffs is a failure. Just making the playoffs is not good enough. If that’s the case, what’s missing the playoffs going to get you? The Blue Jackets could magically figure everything out, make the playoffs, upset Tampa Bay in round one and then you’d have a completely different story. But we’re not there at this point. While the on-ice product is a mess, management must be held accountable too. If they miss the playoffs, hard questions need to be asked of them. Don’t worry fans, he’s part of this equation just like everyone else. It’s the coach’s job to make sure his team is ready to play every night with full effort. Losing in Boston in OT was a good point to gain. Losing a close one in Calgary will happen as the Flames are one of the best teams in hockey. But the game in Edmonton can’t be ignored. What in the world was that effort? It didn’t matter the game was 1-1 in the third period, the effort throughout the night was unacceptable for a team that needed a point to maintain a playoff spot. The Blue Jackets give up a goal 45 seconds into the third period and then sleep walk the rest of the time. When the smoke cleared, the Oilers finished with a 2-0 record against the Blue Jackets outscoring them 8-1. They made Mikko Koskinen look like a Vezina-winner. While the players to a man need to look in the mirror and find a solution to this, Tortorella has to make sure his team is ready every night. Then he dropped this telling quote about the state of the Blue Jackets. If Tortorella is saying this with eight games left in the season, something is wrong. Is Tortorella’s message getting stale? The Blue Jackets are one of the worst first period teams in hockey in terms of goals against. More often than not, the team is not ready when the puck drops. That’s on the coach. In addition, it’s fair to wonder if a change is needed behind the bench especially if they miss the playoffs. This is to take nothing away from what Tortorella has done for the Blue Jackets. But like the core and management, Tortorella hasn’t won a playoff round. Sometimes you need a different voice. Sometimes you need to have a coach that can better utilize the roster. Duchene and Dzingel each scored over 20 goals in Ottawa then come to Columbus and can’t get it going. It’s fair to wonder if the system they play is limiting what these players can do. That’s what management must weigh if they miss these playoffs. Would it be in the best interest of the Columbus Blue Jackets to keep Tortorella beyond this season if they miss out? There are just so many unanswered questions on the Blue Jackets as to why they got into this position with just eight games left. It’s even fair to wonder if they’re a team. When too many individuals try to take over games, it’s not a good sign. Some players may have checked out. Others may be folding under the intense pressure of these games. But no matter what your view of the situation is, one thing is true. This meltdown is a total team effort from top to bottom. You win as a team, you lose a team. However they must be held accountable given the expectations they placed on themselves. The Blue Jackets are potentially just eight games away from finishing by far the most disappointing season in their existence if they don’t make the dance. If they hope to avoid this catastrophe, it starts Sunday night in Vancouver and must carry on through the rest of the season. They do control their own destiny still. But if they continue to have games like they did Thursday, the season will end early and the team from top to bottom will need a serious evaluation of all players, all positions. Nobody is excluded. Can the Blue Jackets rescue this season? It’ll be one of the more fascinating story lines in these last couple weeks to watch.